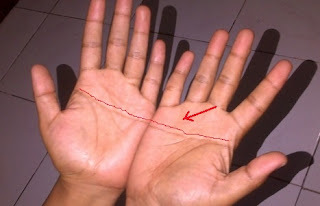 When the Heart Line and Head Line are fused together, only one major line is present, and it extends all the way across the hand from edge to edge. In Palmistry and Hand Analysis this is called a “Simian Line”. 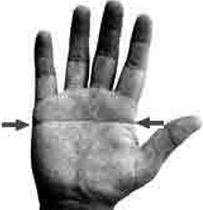 Medical references call it the “Proximal Transverse Palmar Crease” or “Single Palmar Crease”. This is not a pure Simian Line, but rather a strong Heart Line that has captured the Head Line. This person will operate with nearly all heart and emotional energy and will have very little logic and mental power for making decisions and taking actions. Emotions will strongly rule every activity. This shown is not a pure Simian Line, but rather a strong Head Line (blue) that has captured the Heart Line (red). This person will operate with nearly all head energy and will have very little emotional power for making decisions and taking actions. Logic, with little emotion, will strongly rule every activity. 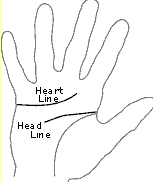 This hand shows a piece of a Heart Line (1) and piece of a Head Line (2). Most likely only one of these pieces would be present on a hand with a Simian Line. Whichever piece is present would indicate that there is some of that energy strongly affecting all activities. For example, if only the Simian Line plus a piece of Heart Line (1) are present, this person’s Simian Line would have considerable influence from heart and emotional tendencies. A piece of Head Line (2) would lend considerable logic and mental influence. This hand does not mean there are two Simian Lines possible. It just indicates that a high Simian Line (A) or a low Simian Line (B) is possible. It is quite difficult to discern which type one has if the line is somewhere in between the high and low positions. In any case, the higher the Simian Line is on the palm, the more emotional energy is affecting all activities. The lower the Simian Line is on the palm, the more logic and mental powers affect all activities. Approximately 4% of Caucasians have this line on at least one hand. Approximately 13% of all Asians have it on at least one hand.It is even rarer to have this line on both hands. Males are twice as likely as females to have a Simian Line. The name “simian” was adopted many years ago and comes from the fact that some monkeys have only one crease in their palm. Just wondering what if almost all my lines are connected and my head and heart line are line intertwined with each other and almost every line is connected to them?